After a lengthy delay, I'm finally going to finish off posting about our trip to Prague, Czech Republic. In case you missed them, you can check out the previous posts here. I will be the first to admit my lack of knowledge when it comes to Judaism. Growing up, I didn't know any Jewish people and aside from knowing of the holocaust, my information was fairly limited. Lately, I've been seeking out information in hopes of deepening my understanding of historical events and the Jewish museum in Berlin was the perfect place to start. Continuing my quest, the Jewish museum of Prague was next on the list. The Jewish Museum in Prague actually a collection of buildings in Prague's old Jewish ghetto and consists of several synagogues, the Old Jewish cemetery amongst other sites. It is the most visited Jewish museum in the world due in part that despite being occupied by Nazis, many of the buildings were allowed to stand. Apparently the Nazis had planned to create a 'Museum of an extinct race' after the Final Solution was complete. We began our journey at the Pinkas Synagogue. Built in 1535, the synagogue has since been transformed into a memorial to the murdered Jews of Bohemia and Moravia. Inside, the names of 80 000 victims of the holocaust cover the walls. Organised by town and last name, the writing literally envelops the entire interior. Reading through the names of entire families was incredibly hard yet moving and it certainly brought a sort of reality to the history we have heard so much about. I can only imagine what it must be like to find your family name amongst the many inscribed. The second exhibit in the Pinkas Synagogue is found on the second floor and is a collection of children's drawings from the Terezin concentration camp. Most of the children were moved to Auschwitz and subsequently, their death from Terezin but some 4500 pictures survived thanks to a teacher who had buried them in a suitcase. The drawings offer a rare glimpse into the eyes of the young. Just outside of the synagogue lies the famous Old Jewish Cemetery where some 100 000 graves and 12 000 tombstones lie. The cemetery dates back to the 1400s and continued to be a final resting place up until 1787. The Jewish were not able to be buried outside of the ghetto forcing them to layer the graves up to 10 layers deep. We knew we didn't have time to visit every site within the Jewish museum so we chose to round out our visit with the Spanish synagogue, thought to be one of the most impressive synagogues in all of Europe. 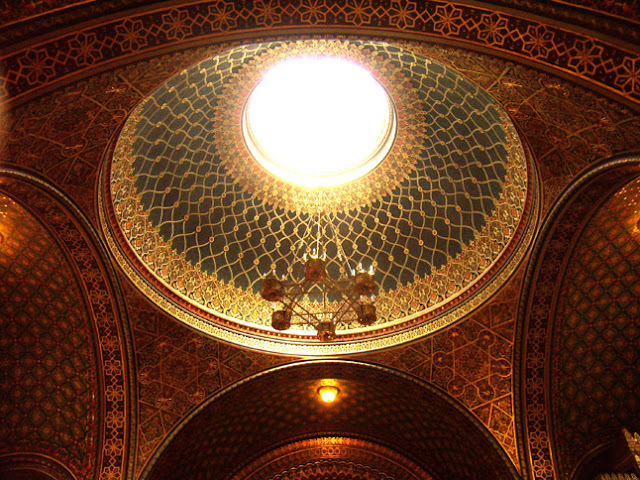 The interior is stunning and the intricate patterns that cover the walls, ceilings & domes left me standing in awe. Today, the synagogue serves as a concert hall and I can't think of a more beautiful place to listen to music. Note: Photographs are prohibited at many of the sites within the Jewish Museum. While you can purchase your entrance ticket to each individual site, we chose to buy a full entrance to each exhibit as the ticket is valid for multiple days. Unfortunately, we didn't have enough time to make it back to the other sites. Today I'm being featured on Expat Edna's "I Love My Neighbourhood" series. You can check out my post here. Beautiful. If you want a little bit of a different take on the Holocaust, I'd recommend Sarah's Key by Tatiana de Rosnay and The Book Thief by Markus Zusak. They're both fiction, but the authors do a pretty decent job of covering the Holocaust from a different angle. I've read both of those books - you are right, both great reads! Wow I didn't know that about the graves. Your pictures are great! I still need to read The Book Thief, but I thought Sarah's Key was amazing. Wow, I didn't know anything about this. Your pictures tell an amazing story, along with your words. It makes me want to visit these places so very badly. definitely need to do these tours next time. I only know anything about Jewish heritage because my grandfather taught a college course on it and we celebrated Hanukkah. We're not Jewish though...I was very confused as a child. In other news...haha. Those pictures turned out gorgeous (no surprise there), it looks like such an awesome place to explore! What an amazing this to see in person. I've not made it to Prague before, but would really love to. Thank you for sharing your photos and what the experience was like for you. Just found your blog!! I am so excited to read about the journey you guys are on!